With Hurricane FIorence and the general hurricane season upon us, here are a few tips for handling your donor milk. Hand expression prevents mastitis and engorgement, maintains milk supply, and allows one to express to bottle feed during natural disasters without reliance on an electric pump. Here's a good place to learn more. If you have a stash of milk that you want to donate, make plans now to get your donations to your milk bank before the storm hits, especially if you aren’t local. Before a storm, freeze large ziplock bags of water and place them over your frozen milk. This will help keep the milk frozen longer in case of a power outage. Do not open your freezer unless necessary. If the power is out for 12 hours or more, you will need to start either transferring your milk to another freezer with power, packing milk in a cooler with ice, or packing your freezer with ice to keep your milk from thawing. Milk that has fully thawed should not be refrozen due to the risk of bacterial contamination. Has Milk Thawed and Refrozen? Freeze a cup of water. Once it's frozen, put a quarter on top of the ice. Any time you open the freezer, check to see if the quarter is still on top. 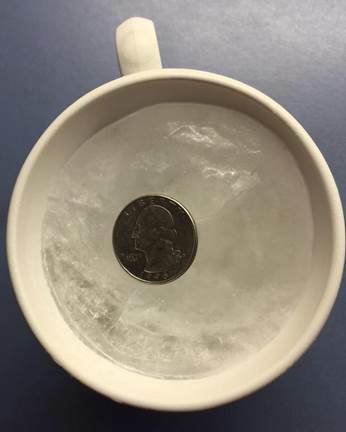 If you find that the quarter has fallen or repositioned itself and the ice is no longer flush, you know that items in your freezer have thawed and refrozen. In that case, unfortunately, your frozen milk can no longer be used as donor milk. Thanks to the King's Daughter's Milk Bank for sharing these tips!